At the start of January we released two reports looking at corporate executive pay. The first, our annual report on the 100 richest Canadian CEOs, calculated that by 11:33 a.m. on Jan 2, Canada’s richest CEOs had already made $50,759—the amount the average worker will make in a year. The same day, we also released a report looking at the gender pay gap among top executives, which found that female top execs make $0.68 for every dollar their male colleagues take home. The pushback I get every year from corporate Canada is that these outrageous pay levels, and now the outrageous gender pay gap, are based on merit. These execs are incredibly talented, we’re told; they earn every nickel filling the gulf between your pay and theirs. The gender pay gap alone makes the merit argument seem pretty weak, since it implies that women are not in the C-suite because they just aren’t good enough. When there are 10 million working women in Canada, the idea that there are not 124 of them to fill top CEO jobs—and erase the gender gap—strains credibility. It’s far more likely that, like so many traditions, old boys’ clubs die hard. Evidence that higher numbers of female executives produce better corporate results are just not sinking in. Well, it turns out the same can be said for the evidence about excessive pay for CEOs, whatever their gender. Paying your CEO more has no relation to your company’s stock market performance. In fact, it could be worsening it. Remember, with over 80% of executive pay being in bonuses related to the stock price, there should be a strong incentive for executives to try and drive up the stock price if they can. Incidentally, these bonuses are what’s driving both extreme rates of CEO pay and the gender pay gap. The chart below has every one of Canada’s top executive as a single point with their pay on the vertical axis and the change in their company’s share price on the horizontal axis. This includes CEOs, but also all the other top executives like CFOs, COOs, etc. from the 250-odd companies on the TSX composite. See an upward sloping trend line in that blob of dots? I certainly don’t. If you plot the line of best fit, the relationship is slightly negative. For every $116,000 decrease in pay, you get a 1% boost in share price. In one extreme case, the best paid CEO in 2017, receiving $54.8 million, oversaw a fall in Hudson’s Bay’s share price of 35% since January 2016. More important than the line in the graph is what it explains, known in statistics terminology as the R2. 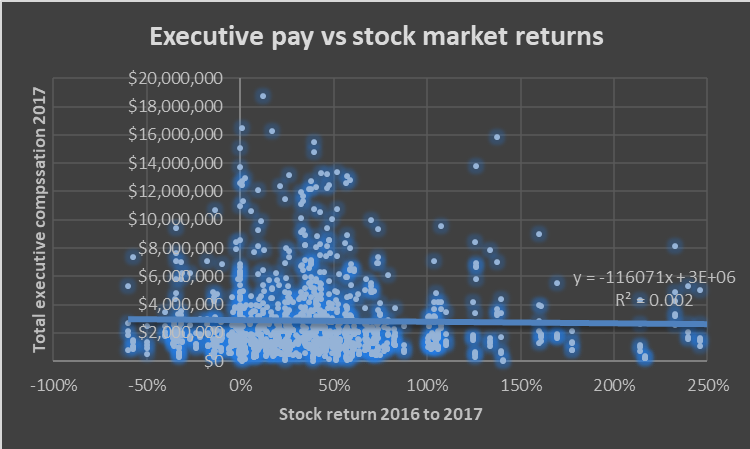 At 0.002, that number tells us there is statistically no relationship between executive pay and company stock price in Canada over this period. Put another way, other factors explain 99.8% of variations in executive pay. So, you can pay your execs more, but this will either have no effect on your share price or possibly it will drive the price down, not up. Source: Company proxy circulars, Yahoo Investor and author’s calculations. Each dot is one executive. Change in stock price is from Jan 2016 to Dec 2017 to pick up previous stock performance that might influence 2017 pay. Compensation is for 2017. And yet executive pay has been rising far faster than worker wages for decades, partly to buy the better stock performance that it clearly doesn’t buy. Moreover, all this bonus pay seems to flow to male and not female executives, driving the key component of the executive gender pay gap. Power, not merit, is driving income and gender pay gaps. David Macdonald is a senior economist with the Canadian Centre for Policy Alternatives.
? Excessive CEO pay: What is to be done?